The UK boss of motorised scooter company Segway has fallen to his death in a tragic accident, after riding one of the two-wheeled machines off a cliff. Jimi Heselden, the 62-year-old Leeds-based owner of the Segway company, has fallen to his death after riding a Segway over the edge of a cliff and into the River Wharf. Ex-miner Heselden set up the UK Segway operation after making his millions from founding his first company HESCO Bastions with his redundancy pay when he was laid off from the pits. Heselden was worth over £166m and ranked 395th on the Sunday Times Rich List. He was believed to have been inspecting the grounds of his North Yorkshire estate on an off-road version of the Segway. A passer-by found Heselden's body in the Boston Spa area at about 11.40am on Sunday 26 September. A spokesman for West Yorkshire Police said: "Police were called at 11.40am yesterday to reports of a man in the River Wharfe, apparently having fallen from the cliffs above. 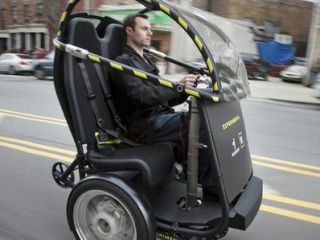 "A Segway-style vehicle was recovered. He was pronounced dead at the scene. At this time we do not believe the death to be suspicious." Heselden made his millions from defence contracts, after he created the "blast wall" - a wire-cage water containment system which proved to be a significant defence against bullets, missiles and suicide attacks for soldiers in Afghanistan and Iraq. A West Yorkshire Police spokesman said: "Police have named James William Heselden as the 62-year-old local man who was pronounced dead yesterday after being pulled from the River Wharfe near to Leys Lane at Boston Spa. "Officers were called to the incident around 11.40am following a call from a member of the public. "Mr Heselden, who is from Thorp Arch, was pronounced dead at the scene by paramedics. "The incident is not believed to be suspicious and the coroner has been informed."